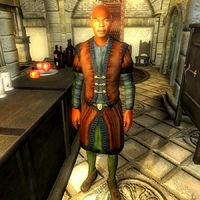 Wilbur is a Redguard publican and the proprietor of The Count's Arms, one of the most popular gathering points in Anvil. He is said to have an extensive knowledge on fine wine and the taproom reflects just that, with its wide array of bottles on display. Unfortunately, Wilbur himself never mentions it and the only thing he sells is food and shelter for the night. He takes great pride in both his city and his establishment and serves his various customers and regulars twenty-four hours a day, without ever eating or sleeping. He wears a set of simple middle-class clothing, a russet felt outfit and pigskin shoes. He only carries a considerable amount of gold. When you approach him, he will politely introduce himself and his inn: "I'm Wilbur, owner and proprietor of The Count's Arms. We make beds and food available to guests. Can I help you?" When asked about Anvil, he will give you a lesson in local architecture: "Buildings here look different. Why? This is the Gold Coast style, like in Hammerfell. Eastern towns look grey and dull to me." If you ask him for a bed, he will give you the full sales speech: "There's a wonderful room available. It's the best I have, and you can use it for the night for a mere 25 gold. Interested?" If you accept, he will point you towards the room: "Excellent. It's up the stairs there, and then directly across the hallway. Center room, wonderful view of the city. Sleep well!" Although Wilbur never talks about it, the townsfolk of Anvil often discuss his enthusiasm for fine wine. When asked for rumors or during conversations they will say: "The Count's Arms is a very nice place for a meal. And Wilbur has an extensive knowledge of wines. ", "I enjoy a good bottle of wine, and Wilbur always has a nice selection. ", "I've had many good meals at the Count's Arms. I've had even more good bottles of wine there." and "Have you spoken to Wilbur at the Count's Arms? He knows a lot about fine wines." Esta página foi modificada pela última vez à(s) 05h52min de 20 de outubro de 2015.